REPAYE provides the lowest monthly payments together with interest subsidies if your AGI is low. But above a certain AGI, PAYE payments are capped (while REPAYE’s are not). And PAYE gives you the opportunity to isolate your income from your spouse’s, if you desire. Choosing REPAYE is good if you are not 100% sure you'll stay in a PSLF-eligible job for 10 years, because the interest subsidies are immediate and yours to keep regardless of PSLF. If you are otherwise 99%+ certain you'll stay in a PSLF eligible job, then there are cases where PAYE can be a better strategy. REPAYE provides the lowest possible monthly loan payment for those with training-level salaries and no significant spousal income. The REPAYE payments are the same as PAYE and “recent” IBR borrowers. However, for those with a high loan to AGI ratio, REPAYE provides immediate interest subsidies which do not depend on PSLF. Click here for a chart which describes the value of the REPAYE loan subsidies. Upon marriage (or a large jump in salary for those who are single) REPAYE payments can exceed the standard 10-year payments. This is because REPAYE always takes spousal income into account. Including spousal income will reduce and can even eliminate loan forgiveness. 1) Can eliminate spousal income from your income calculations if you file separately (although PAYE does not require filing separately). This is not possible with REPAYE. 2) Caps your payments at the 10-year rate regardless of you or your spouse’s income. REPAYE payments have no cap. 1) Any plan which results in decreased payments has the potential to increase the total amount of money you will pay if you end up not qualifying for PSLF because those amounts will just be deferred and interest will accumulate. 2) Any previously uncapitalized interest which had accumulated under REPAYE gets added to your loan payments when switching to PAYE. This has the net effect of increasing your future interest accumulation. That is, you’ll start paying interest on the interest. If you end up with PSLF, however, this is of no consequence to you. 4) Your PAYE cap is based on the total interest+principal when you first enter PAYE. Which means your max payments (aka the cap) are higher than they would have been had you entered PAYE at the outset. Therefore, if you are otherwise certain you a) will have a spouse with income and/or b) reach the cap due to your high salary and/or loan balance amount c) eventually qualify for PSLF, then you are better off choosing PAYE from the beginning (rather than REPAYE), because those interest rate subsidies are meaningless if you get PSLF. Anything which lowers your “Adjusted Gross Income” (AGI, line 7 on the new 1040 forms as of 2018) will lower your income-driven loan payments with REPAYE, or with PAYE if you are under the 10-year payment threshold. If you are above the PAYE 10-year threshold, reducing your AGI will not lower your payments (unless you reduce the AGI enough to get under the threshold, of course). But if you are near or over the threshold then you are likely in a high enough income range where it is prudent to minimize your AGI for tax purposes anyway, regardless of any effects on your loan payments. Things which lower your AGI include: 401k or 403b contributions, health savings account contributions, employer dependent care or flexible health care contributions. These items are subtracted from your salary prior to being reported as wages in Box 1 on your W2. Thus, consider making 401k/403b contributions (as opposed to Roth contributions) with the extra cash-flow you get from lowering your payments when using an income-driven plan. 1) PAYE allows you the option to file as “married filing separately” (MFS) to reduce your monthly payments in marriage. However, MFS will likely cost you extra in federal income tax and (if applicable) state income tax. This extra amount may be trivial, but can also be large enough (particularly if you have children) to negate the advantage of switching to PAYE. You must calculate the extra taxes you will pay if considering the MFS/PAYE route. The only reliable way to do this is to to prepare three sets of sample taxes in advance: yours alone, spouse alone, and married filing jointly. We have a page which can give you an idea of the ranges of extra tax you might be expected to pay when going from MFJ to MFS. 2) PSLF may be taken away or altered by new legislation or policy change (although no one has ever proposed making changes to existing borrowers). If so, and if you intentionally pay less on your loans, you will have paid more interest on your student loans than otherwise. Despite this risk, choosing the income-driven repayment plan which has the lowest payments carries relatively little risk, assuming you do not simply splurge the extra money you have by minimizing your payments. Save or invest that money instead! 3) If you are fairly certain you'll eventually get PSLF, and are likely to have a spouse with income and no loans or have a very high salary which eventually puts you over the cap, you probably should start with PAYE at the outset, rather than REPAYE. Consider a non-married resident who is about to graduate from a pediatric residency and join a PSLF eligible hospital-based group with a salary of $200,000 (there is a ton of call in this job, hence the high salary for Peds). She finished medical school with $200,000 in unsubsidized federal loans at an average of rate of 6%. She thinks after another 4 years she will move back to her smallish hometown, where her salary is likely to be much higher ($300,000). She was smart and had consolidated her federal loans just prior to graduating from medical school in order to eliminate the grace period and start the 10-year PSLF forgiveness clock immediately upon graduation. She chose the REPAYE plan. Please read this scenario for an explanation why. She has a boyfriend and is getting married this year (her PGY-3 year). He is finishing up law school (with private loans only) and will be starting a job mid-year making $150,000. Their goal is to minimize payments on her loans using an income-driven plan in order to 1) continue to qualify for PSLF and 2) use the extra cash flow to begin investing in their 401ks and to help with paying down his law school debt. The Monthly Payments Chart shows the hypothetical progression of their income over 10 years. They are currently in Year 3, and thus their marriage won’t affect her loans until he re-certifies his income in Year 4. Notice the monthly payments under each plan, and how much they increase in the 4th year due to the increase in their incomes. If this borrower stays in REPAYE, her payments will jump even higher than the 10-year standard payment by Year 5. She also loses the REPAYE interest subsidies in Year 4. With the PAYE plan (married filing jointly; “MFJ”) the payments are about $500 per month less than REPAYE in Year 5. They are a whopping $1250 per month less if they choose to file separately (MFS). You can better see how the payments compare by year by looking at the graph below. Another way to view loan payments is to consider the running total loan costs to the borrower of each plan as the years go by, as in the following chart and graph. Remember, if one is confident about qualifying for PSLF, then the goal of choosing an income-driven plan is to reduce the overall loan cost to you. You don’t really care about the amount of forgiveness. However, the anticipated total federal loan balance plus accumulated interest after 120 qualifying payments, or anywhere along the way (see Running Total Costs above) is important in one very meaningful way: This is the amount you will have to pay if you fail to qualify for PSLF. All things equal, if the loan cost to you is the same, choose the plan and tax filing strategy which minimizes the balance. 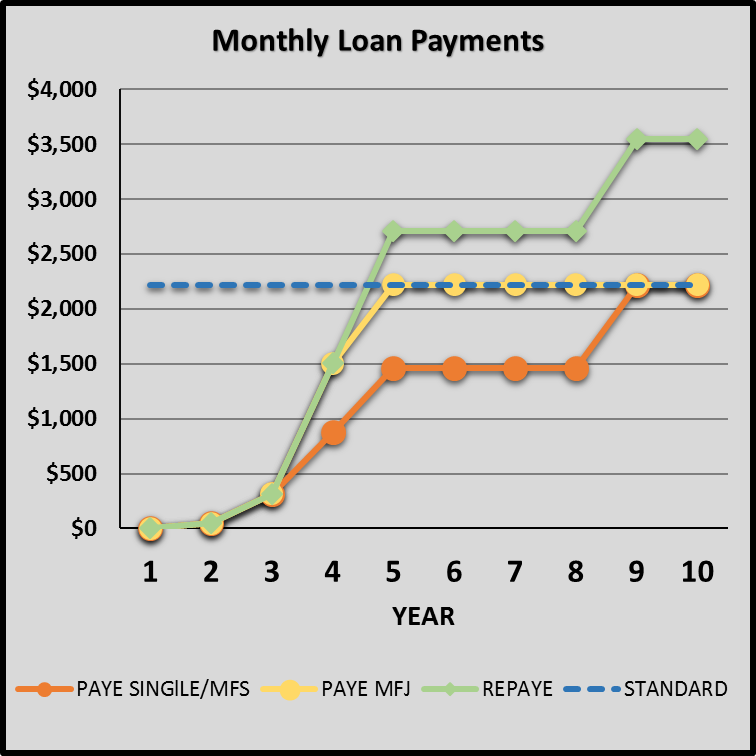 Hopefully our example helps you understand some of the consideration when choosing REPAYE or PAYE and when switching may be beneficial. If you have further questions, please let us know.